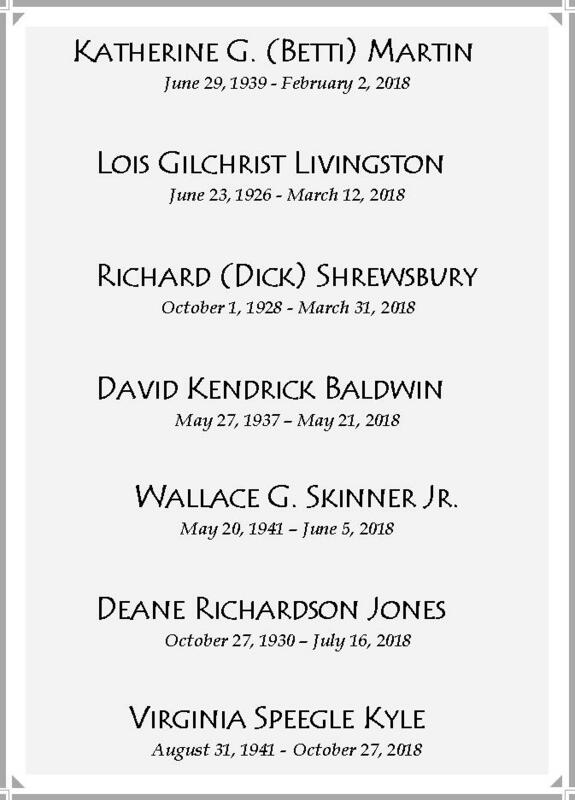 This Sunday, First Presbyterian Church will remember those beloved members who have gone before us to the Church Triumphant. Fall Back: Daylight Savings Time: Don't forget to move clocks back one hour this Sunday morning. Reception for Rev. James Goodlet: First Presbyterian Church "WELCOMES" Rev. James Goodlet this Sunday with a Reception immediately following the 11:00 a.m. worship in the Fellowship Hall. Stewardship Update: Thank you to all of you who have already made a financial commitment for 2019. It has been a wonderful season for FPC to remember all the ways OUR DOORS ARE OPEN , and to be reminded that, OUR TIME IS NOW! As of Wednesday, October 31, 95 pledges have been received totaling $535,000. If you have not turned in your pledge card, it is not too late. You can return it to the church office or drop it in the offering plate. Please help us conclude this Stewardship Season in such a strong way that ALL of the ministry we are called to do can faithfully happen in 2019. WE can do this together! Christmas Dinner Event: Ladies, “Save the Date” for the 2nd annual Christmas dinner event, “Everlasting Light,” on Thursday, December 6 at 6:00 p.m. Beth Duttera Newman will be our guest speaker. For reservations, contact Jill Henderson, jillhenderson@bellsouth.net, or Lennice Parker, del_parker@bellsouth.net . 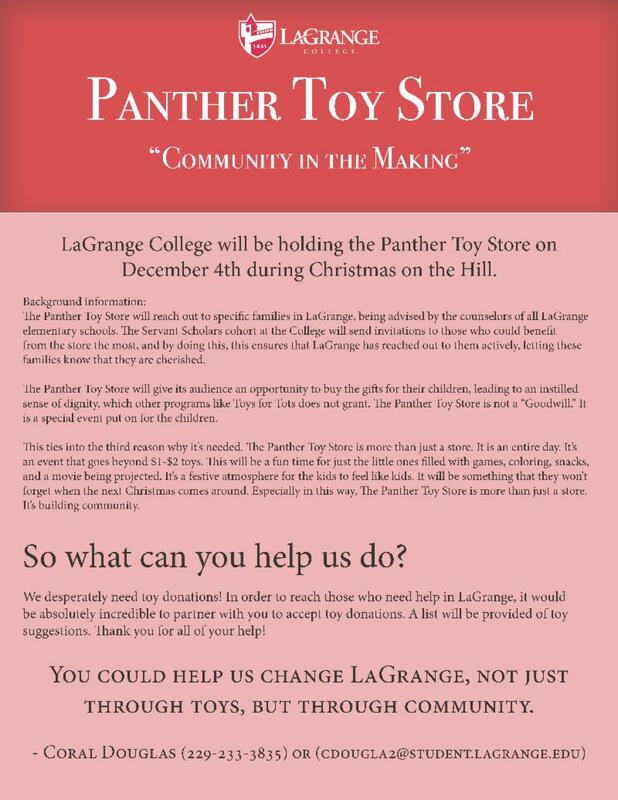 The PYC 45 is working with Lagrange College to stock their Panther Christmas Store for parents to purchase toys for their children. Suggested donations: Books, Puzzles, Arts and craft kits, Play dough kits, Sports equipment, Multicultural dolls, Doll strollers , Play make up, Toy trucks and cards, Building blocks. These are just some of the ideas that would work as gifts. Please place in bins by Emily Parrish’s office or in the PYC 45 room on the third floor. For more information, please contact Deb Sargent at 706-333-8647. The Council Draft is a meeting of council chairs who choose new members for 2019. The Draft this year is on Wednesday, November 14 at 7:15 PM in the second floor meeting room. Wednesday Night Supper Menu: “ Down by the Riverside” Fried Cat Fish, Fish Tacos, Pizza, Slaw, French Fries, Hush Puppies, Salad Bar, and Banana Pudding. Retreat from the world for an hour. Nurture yourself as we explore the nature of grief, engage in caring for ourselves and learn to hold sacred space for our grief over the holidays. On Monday, November 12, 6-7pm , First Presbyterian Church and St. Mark’s Episcopal Church will host a program on grief. The program will be held at First Presbyterian Church and will be led by Susan Marshall, LPC. Susan is a psychotherapist and the founder of The Center for Mindful Exploration. We will explore what we need during times of grief and learn to honor this painful, but important process. This program is free but requires a reservation. To reserve your spot, please call (706) 884-4064. On Saturday, November 10th, 10am – 3pm, The Center for Mindful Exploration will hold their Fall Silent Retreat at Camp Lumpkin. The cost is $30 and includes lunch. You can see their website mindfulx.site for more information or to register. On Wednesday, December 19, St. Mark’s Episcopal Church will host an ecumenical service for those who struggle with the holidays. That struggle could be about missing a loved one, either through death or geographic distance, or that struggle could simply be about the demands and expectations of the holidays. The service begins at 5:30pm and is an hour in length. Call St. Mark’s at 706-884-8911 for more information. ﻿ October 24-27 at 7 p.m. and October 28 at 2:30 p.m.
"Crazy for You" The New Gershwin Musical, Price Theater on Panther Way. For information contact the box office priceboxoffice@lagrange.edu or 706.880.8080. Toy Possibilities for Panther Toy Store!